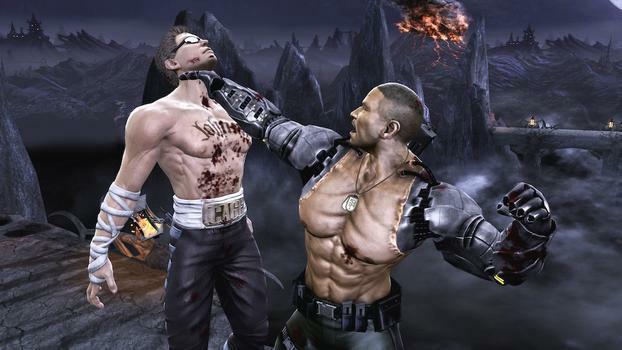 It's no mystery that 2011's Mortal Kombat is one of the seminal fighting games of this generation. With its impressive roster of characters, lengthy story mode, 300 level challenge tower and more secrets than you can dig up in a haunted graveyard, it's easy to see why Mortal Kombat became a hit with critics and successfully resurrected the aging franchise. The real mystery is why it took Warner Brothers more than two years to release this exceptional fighting game on the PC. As the title suggests, this is a port of the same Mortal Kombat: Komplete Edition released in 2012 for the Xbox 360 and PlayStation 3. Despite coming seventeen months later, this PC port doesn't include any of the extra modes, fatalities and challenge tower stages found in the PS Vita version. Also missing is God of War's Kratos, an exclusive to Sony consoles. That leaves this long-overdue port, well, inkomplete. Before we get too far ahead of ourselves, let's discuss what Mortal Kombat is. In a lot of ways this is a return-to-basics reboot of the franchise name. 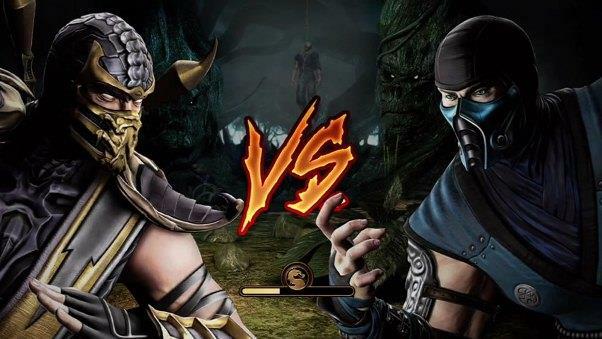 Despite the gorgeous 3D modeling, this brand new Mortal Kombat is a 2D fighting game through and through. All of the old characters, moves and secrets are back in this update. 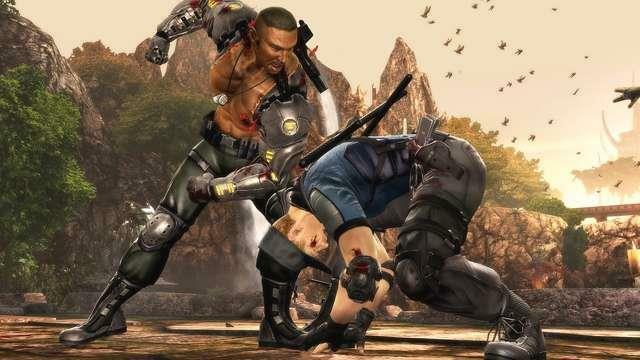 Best of all, the game's bone-crushing, blood-squirting, spine-ripping violence is as gruesome as ever, which should delight longtime fans of the series. While much of the gameplay feels traditional, there are a number of additions that can really change the course of a fight. Mortal Kombat has a three-part power meter, which allows players to perform enhanced versions of each character's special moves. On top of that, there's an "X-Ray" attack which shows us in vivid detail exactly what happens when we're hit, stabbed and set on fire by these murderous fighters. Thanks to the much-improved graphic engine, these powerful hits make an impact. I found myself cringing while performing the x-ray attacks, some of them are as brutal as anything I've seen in this series. Another thing that helps sell the violence is the way the carnage sticks around. Mortal Kombat characters have always showered their opponents in blood, but now that gooey red stuff stays on the fighter. In fact, every punch, slash and stab leaves a mark. By the end of the round each fighter looks completely torn apart, making this one of the most visually satisfying fighters I've ever seen. In a lot of ways, the new Mortal Kombat is a lot like J.J. Abrams recent Star Trek movie. Instead of starting over from scratch, the game has a conceit where a nearly defeated Raiden sends a message back to himself in the past. This vision hits Mortal Kombat 1 era Raiden, who realizes that he has to scramble and piece together a group of powerful fighters to protect the EarthRealm. He fears that if something isn't done, two realms will merge and humanity will be doomed for eternity. Earth's last hope is riding on Liu Kang, Kung Lao, Jax, Sonya and a handful of other rough and tough brawlers. This sets into motion a narrative that effectively retells the story of Mortal Kombat 1 - 3. We're given a large cast of familiar faces, nostalgic backgrounds and the same over-the-top fun we had back in the days of the arcade. But not everything is the same. Much like the Star Trek reboot, this new game takes some liberties with the story. Mortal Kombat is full of familiar events happening in fresh new ways, along with just enough twists and turns to make this story exciting again. In case you haven't noticed, that's a lot of story. Most fighting games have a paper-thin narrative; just enough to justify making a bunch of characters battle it out. But that's not Mortal Kombat. In this game you're given a lengthy (we're talking six - eight hour adventure) story mode that fills in the story of the first three MK releases. Through a series of chapters, we're given the ability to play as sixteen different characters and see how each of them ties into the mythology. The story mode is nothing more than an interactive soap opera, one that involves lengthy cinema scenes that always result in somebody fighting somebody else. The structure may not be original, but the execution is mind boggling. Not only was Ed Boon able to tell a fairly intricate story full of intersecting characters, but he did it in a way that gave me a greater understanding of the cast as a whole. I found myself constantly impressed that I was starting to care about characters I had written off long ago. Thanks to this game I have a newfound respect for a lot of the minor characters from Mortal Kombat 3 (Stryker, Cyrex, etc.). As impressive as the lengthy story mode is, it's really just one of the worthwhile modes found in Mortal Kombat. When you're not trying to defeat Shao Kahn once and for all, you can work your way up the 300 story tower. This mode offers fans a chance to test their skills in a number of challenging ways. While most modes require little more than you defeating your opponent, there's usually a catch along the way. Sometimes your controls will be reversed, the fight will happen on the ceiling or you won't be able to block. That's just the start of the crazy things you'll see while climbing the tower. In one stage you'll play as Cyrex throwing bombs into a moving garbage can. In another level your arms and head will be literally chopped off before the round starts. In another stage your own attack will be to throw your arms and legs at the opponent. Some stages will test your combos; others will look for total damage. 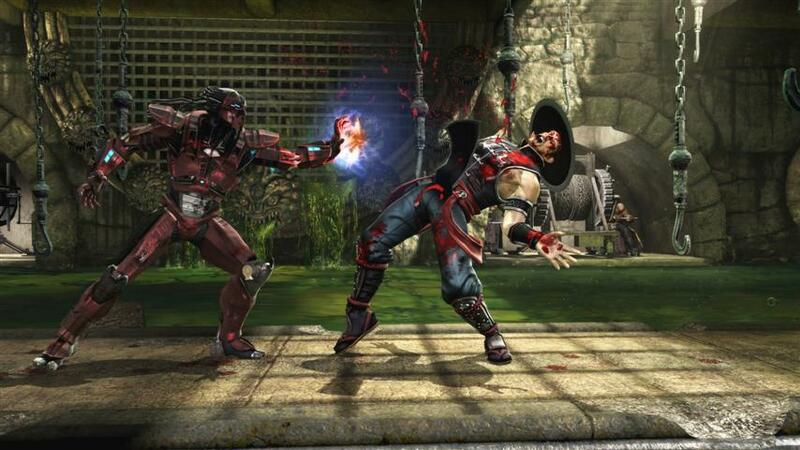 You'll often have to learn special moves and perfect the different fatalities. And best of all, these 300 stages become increasingly difficult. You really have to prove your worth if you're going to reach the top of this tower. Maybe you're not the kind of person that cares about lengthy story modes and a robust challenge tower, maybe you just want to fight like the olden days. Good news, Mortal Kombat features all of the standard arcade-style modes you're used to. You can climb the single-player tower for all 28 fighters, offering a what-if scenario where that fighter wins the tournament. Fans can also go through this arcade-style mode as pairs, turning this game into a tag team affair. If that's still not enough for you, then you should take a look at Mortal Kombat's four bonus stages. Test Your Might returns from the original Mortal Kombat and is joined by Test Your Luck, Test Your Sight and Test Your Strike. These stages will have you mashing buttons to break objects and watching a disgusting variation on the cup game. With more than fifteen hours of single-player content, I can see some players going days (or even weeks) before challenging another living person. The amount of content in Mortal Kombat is staggering, and not just for a fighting game. Most modern action games and first-person shooters don't come close to offering this much stuff to do. This repackaged version still offers all of the incredible modes, extras and fatalities found in 2011's $60 model. This time around Warner Bros. Games has reduced the price and added in the additional characters previously only available online. The four new characters include Skarlet, Rain, Kenshi and ... Freddy Krueger? It's true, longtime movie villain is ready to take down Scorpion, Raiden, Jade, Baraka and the rest of the Mortal Kombat gang. Of all the versions available, this PC port is by far the best looking. The backgrounds have never been more vibrant and the gory fatalities look about as realistic as they can be. And just like its console counterpart, Mortal Kombat: Komplete Edition moves at a brisk 60 frames-per-second. If visuals are important to you, then this PC version is the one for you. Unfortunately, I didn't have nearly as much luck playing online. For whatever reason, I ended up having some troubling lag issues. Furthermore, the matchmaking was substantially slower than on game systems. I was still able to have fun playing Mortal Kombat online, but not without a little hassle. Mortal Kombat on the PC is every bit as good (if not better) than what was released on home consoles more than two years ago. It packs more content than any other fighting game I can think of, and the combat mechanics aren't too shabby either. Unfortunately, a lot of my enthusiasm is extinguished by the lack of content from the more komplete PS Vita game. If you don't mind the missing modes and character, then Mortal Kombat: Komplete Edition is a must-buy (even with the somewhat dishonest name). 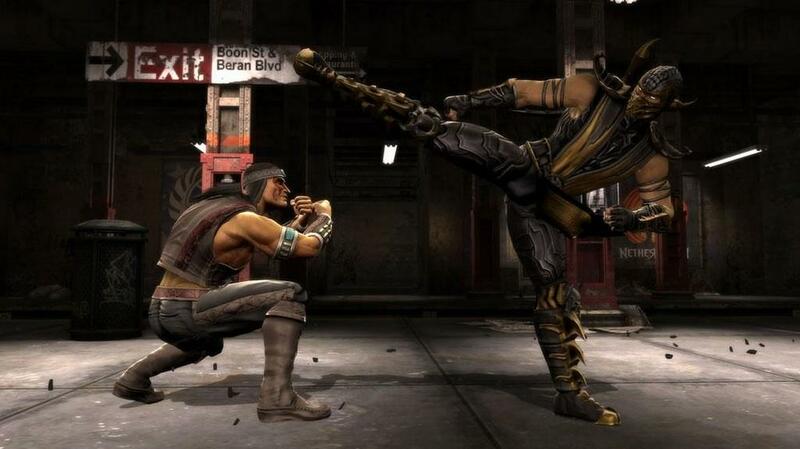 Over two years after it hit the home consoles, Mortal Kombat is finally making its way to the PC. This port may be called the "Komplete Edition," but it lacks much of the content found in last year's PS Vita release. Even in its inkomplete state, Mortal Kombat remains one of the best fighting games of this generation!